Corey and Emily are a couple of New England natives whose individual pasts seem to have fated them together. Corey, 28, grew up playing among the crevices and rocky outcroppings of the New Hampshire mountains. Emily, 30, never quite fit into the traditional “little girl” role, instead finding herself drawn to outdoor adventure as a young woman in Maine. They attended the same college and had some mutual friends, but never really got to know one another. Each had a propensity for kayaking though, and years later found themselves both working at the same outfitter. “It wasn’t until I was hired as a part-time kayak guide in the summer of 2011 that we really got to know each other,” says Emily. Corey was the tour guide manager at the shop. “I was her boss,” he claims. Emily doesn’t seem so sure. 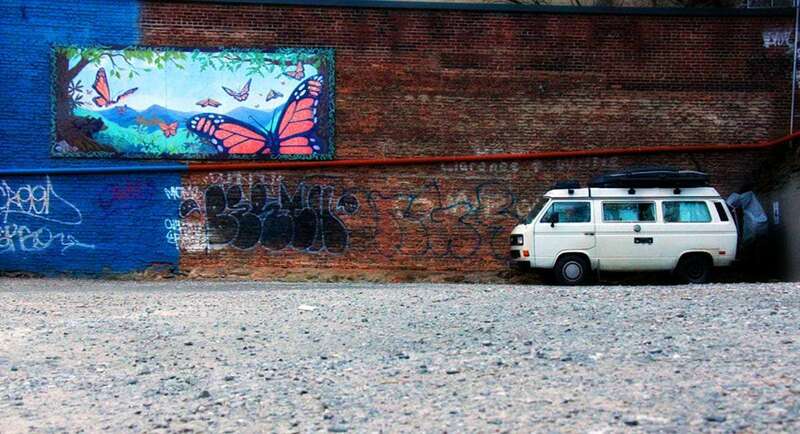 At this very moment they’re organizing their gear and packing it back into Boscha, their 1987 Vanagon, from Emily’s parents house in Maine, though they don’t call New England home anymore. They live in their van. Boscha is no ordinary van. She’s a Volkswagen, and a Westfalia to boot. That means she comes loaded with style, has a pop top, room to sleep four, and a small kitchen. She’s beautiful, though perhaps a little rough around the edges from years of exploring. Before Emily and Corey bought her from her previous owner, a young girl in tears at having to give up such a grand ride, she was used as an on-the-go production house for a documentary film crew doing a piece on the US/Mexico border. 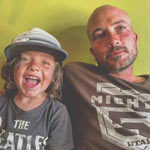 “They’re the Swiss Army Knives of van life,” Corey boasts. The four of them, Boscha, dog and all, hit the road in January of 2013 and have explored the West and back again. As they prepare the van for their next leg–a trek south to Florida–they’re doing more this time than just exploring. 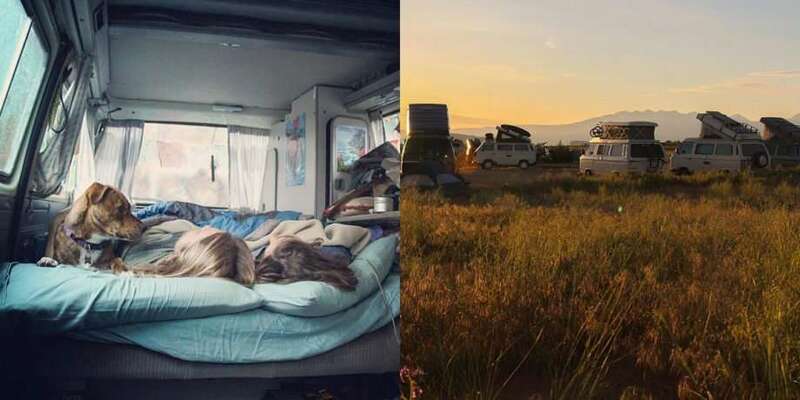 They’ve just successfully funded a Kickstarter project which will allow them to meet up with other travelers and document what life living on the road is like. 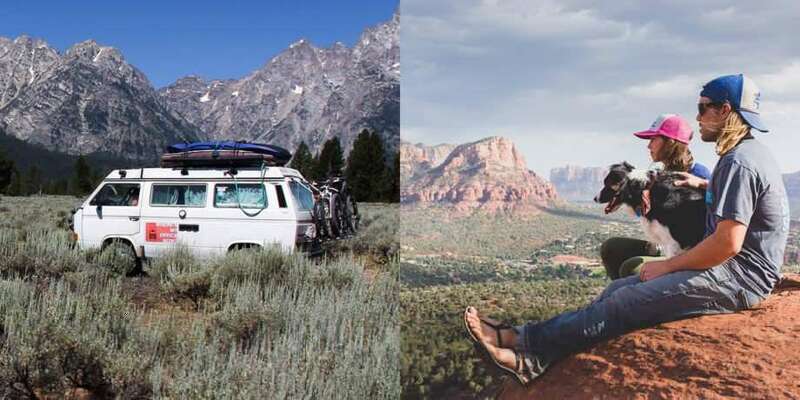 Emily speaks a lot about community, specifically, the growing community of full-timers who are living out of vans, RVs, anyone making a life out of exploring all this great nation has to offer. Their Kickstarter campaign is all about fostering this togetherness. For those on the road, it can be difficult to find fellow travelers who will be in the same neck of the woods as you at specific times. It can even be downright daunting knowing who is out there, how many of us even exist. Emily knows that their is a community, it’s just about finding ways to unite us. These meetups have often lead to exactly the kind of thing that travelers can miss out on: again, community. When you live in a house, in a neighborhood, you’ve got friends, people you see all of the time. When every day brings the possibility of a new location, though, that aspect of fellowship can be absent. Thus, Boscha and her crew have discovered the joy of caravanning. “We’ve caravaned a few times,” Emily’s enthusiasm for this bunch of nomads they’ve encountered is abundant. She goes on to mention a variety of people they’ve hooked up with on the road, and like many travelers, refers to them largely by their Instagram handles. Calling people by their online names is something most travelers experience after meeting a few of their ilk. Just as each of these individuals, couples and families have crafted a life for themselves, created something new and largely different from the typical American lifestyle, so do their pseudonyms reflect the lifestyle they’ve chosen. 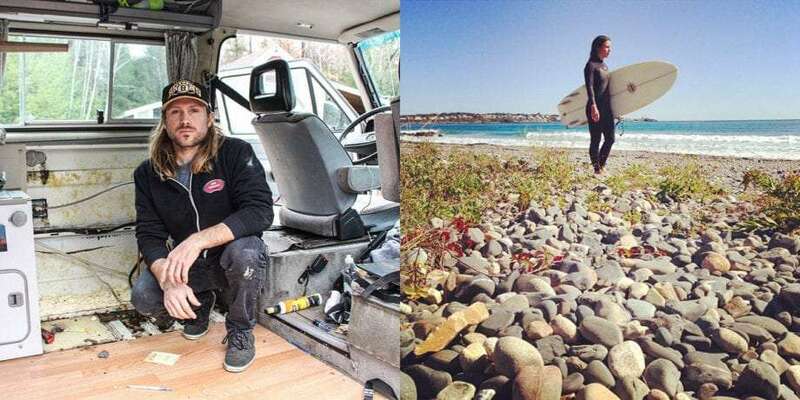 Apart from being travelers, film makers and kayakers, both Emily and Corey have a passion for surfing, and the Volkswagen Bus (a broader term for all VW “vans”, including the Vanagon) is an icon of that subculture. A successful Kickstarter campaign does not make a career, though, and nor are the two independently wealthy. 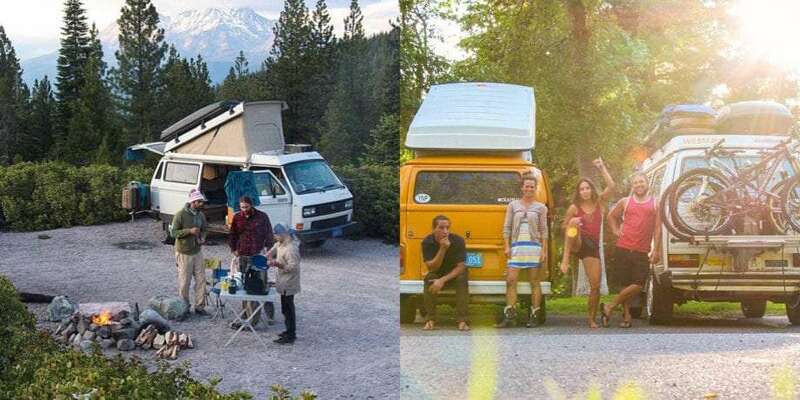 Like most of the vandwelling community, they make their living while traveling, not from it. Part of this experiment was the idea of combining an office job with traveling. Thus their own Internet nickname, Where’s My Office Now? She has some contract work, and fills in the gaps with random projects for small businesses and other organizations. As much as building websites is conducive to such a lifestyle–you can basically work from anywhere you can get an Internet connection, which is nearly everywhere these days–Corey’s past experience as an all-things-outdoor guide would seem to fit right into this lifestyle as well. That hasn’t turned out to be typical, though. Some families have a full-time mom (or Mr. Mom), it would seem Corey has found his niche as both homemaker and resident mechanic, a position I think many of us who’ve lived in vans and other homes-on-the-road would envy. Check out their blog and follow along with Emily and Corey on Instagram. So where does one actually stay when living in a van? Unlike a big RV, you’re not restricted to campgrounds specifically built for hooking up water and electric systems, nor even to those with level enough terrain to tow a trailer into. Without many restrictions, what is their ideal campsite then? There is ample government land where it’s not only legal to camp for free, but it’s down right desirable. Particularly out west, nearly endless acres of land are largely empty of any human imprint, certainly the light pollution and crowded streets of civilization. These places also have few or no services, and so maintaining a career which requires a laptop to have power and cell phone service for connecting to the web does bring some limitations. “When we first left New England, we frequented campgrounds,” Emily admits, referring more to official, organized places you typically have to pay for, like RV parks for example. Corey has set the Vanagon up with solar, so they can generate some power, making this off the grid type of camping more available to them. They’ve also experimented with living in the van and in civilization. “We spent a couple of months in Southern California where we ‘stealth camped’ in residential neighborhoods.” Stealth camping is where you typically just park on the side of a neighborhood street and, via curtain camouflage and keeping a low profile, don’t make the fact that you’re living in a van public knowledge. So what does it take to live this way? What makes Corey and Emily so different, so readily willing to call a vehicle their home. Well then why would they want to live this way? Like the dozens, or possibly hundreds, of people traveling around the continent–indeed the world–living a nomadic lifestyle, they have proven the viability of the lifestyle via their very existence. While it may not be for everyone, Emily and Corey are proof that if the desire is there, the path is easy. When you realize a dream, a truly wonderful, freeing dream, and there are moments of the day you just look around and assess, and realize, “This is my life! I can’t believe it!”, well, you naturally want to share that feeling, that joy, that possibility. And that’s what their Kickstarter is all about. The inspiration to help those on the fence make the leap, to provide information, help others form a clear path. They’d like to take all of our collective enthusiasm, bravado and achievements and create something massive from each individual part, something more powerful than our single engines, a new wave of reality for those who are desperate for travel and want to not only dream big, but actually live it. Though Emily and Corey have already reached their goal, you can still contribute to their Kickstarter campaign (through November 27, 2014). The more they raise, the more they can do. Plus they’ve got some great gifts for those who contribute.